It is said that Mandalorians have long memories, but they have forgotten. 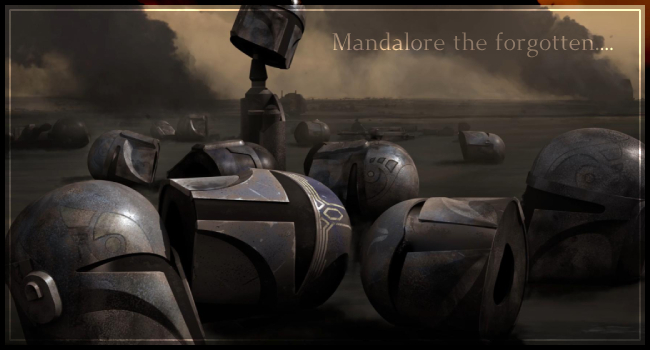 In their arrogance and lust for blood, the Clans of Mandalore descended upon Eshan and laid waste to her people. This was the final offense. The last straw in a long line of grievances. The Confederacy had been satisfied to turn a blind eye to the war-centric nation, but no further could they ignore this threat. In the name of the fallen innocent, they have taken up the sword once again. Edited by Srina Talon, 10 February 2019 - 11:28 PM. "AND I LOOKED, AND BEHOLD A PALE HORSE: AND HER NAME THAT SAT ON HIM WAS DEATH, AND HELL FOLLOWED WITH HER..."
Edited by Adron Malvern, 04 February 2019 - 06:21 AM. Mand'alor the Reclaimer is coming Home. Feth it. I set up the TNT. Guess I'll be here for the explosion. Glad to see my sneaky lil plan playing out. I'll take up a ME Ally slot I guess. Still got dudes on the planet. Edited by Tathra Khaeus, 04 February 2019 - 06:33 AM. I'd like to request an ally slot for the CIS. Edited by Ronan Vizsla, 04 February 2019 - 06:47 AM. Time to, uh, get this bread. As the kids say. Where my nation goes I will follow. Thank you, friends. OOC: Let's have a wonderful time everyone! Cheers! Edited by Srina Talon, 04 February 2019 - 06:55 AM. If the CIS will have me, I guess I could roll for old times sake. Ronan Vizsla Runi Verin - Greetings. Darth Metus welcomes you. If you'd like to join the discord for the invasion let us know. Edited by Srina Talon, 04 February 2019 - 07:07 AM. I've watched worlds burn, I've burned worlds. Time to punch Mandalorians, finally. Any Mandalorian want to do some fisticuffs? I mean, my homies Ronan and Runi are already rolling on this and I got as much of a gat that go rata-tat-tat as they do. I too would be down to clobber buckets. If the CIS would like me to come with them. The healer's coming along too. I can't let my teammates go out there without proper backup. Edited by Skorvek, 04 February 2019 - 08:56 AM. Count me in. This'll be pretty fun. Just be ready for a not-so-topical Mandalorian.